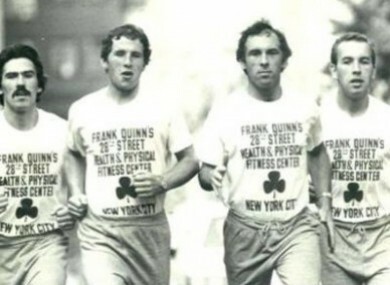 A QUARTET of Irish brothers are to run the New York City marathon on 1 November – 35 years following their first go at the event in 1980. Brothers Michael, Frank, Seán and Brian Quinn, all now in their 60s and originally from Tyrone, are recreating their initial run in order to raise funds for multiple sclerosis charity MS Ireland. The brothers have form in the area, having run the Dublin City marathon together in 2013, 33 years after their first attempt at the New York distance event. Speaking to TheJournal.ie, Michael Quinn says that while the brothers running is a story, “the real issue here is that we’re doing this for MS Ireland”. The brothers have attempted “5 or 6 marathons” per Michael’s recollection. “I’ve been running pubs and hotels in that time so there wasn’t always time to fit in marathons,” he says. Back in 1980 the brothers attempt at the marathon became national news in the US after Brian joined his brothers in America to run the distance. The Quinns were the first set of four brothers in the world to run the prestigious marathon together. Once this news got out, the story was soon picked up by the New York Times who wanted an exclusive. The American TV networks jumped on the story and soon everybody knew the Quinn brothers. “A few days before the race our story was one of the leads across the networks – ABC, CBS, NBC,” said Michael in 2013. At the time, the big news was that Russia had invaded Afghanistan, and our story was right up next to that on the front pages. Once the media picked it up there was no turning back – we had to get fitter and fitter. The brothers own the Lansdowne Hotel on Dublin’s Pembroke Road among other establishments, while Brian Quinn is managing director of Rocwell Natural Mineral Water, who until recently sponsored Tyrone GAA. Via the Lansdowne Hotel the brothers have traditionally sold hamburgers on rugby international days with all proceeds going to the MS charity. “The big change here is that we’re going back,” says Michael. Back in 1980 it was just a concept we came up with. But once it was in the New York Daily News and all over television we decided we had better go through with it. Now the game is on and ball is in and we’re going to have to get through it. But what’s more important is that we’re doing it for MS Ireland. “35 years later we may not manage to do it in the same time as before but our hope is to take part in the marathon once again and raise funds to support people with multiple sclerosis in the process,” agrees brother Frank.